High-speed fibre optic networks are seen as the foundation for successful digitalisation. But there is a risk that Germany can’t keep up. One reason is the focus on vectoring technology, which is now able to reach speeds of 50 to 100 Mbit/s, even with copper wires. But this strategy slows the rollout of fibre optic and FTTH – and future-proof solutions with it. Multimedia is the future of the internet. Whoever wishes to stream HD videos or watch football live online with good resolution needs a fast and reliable high-speed connection. The same applies to (business) applications from the Cloud. So the demand for broadband connections is growing enormously. 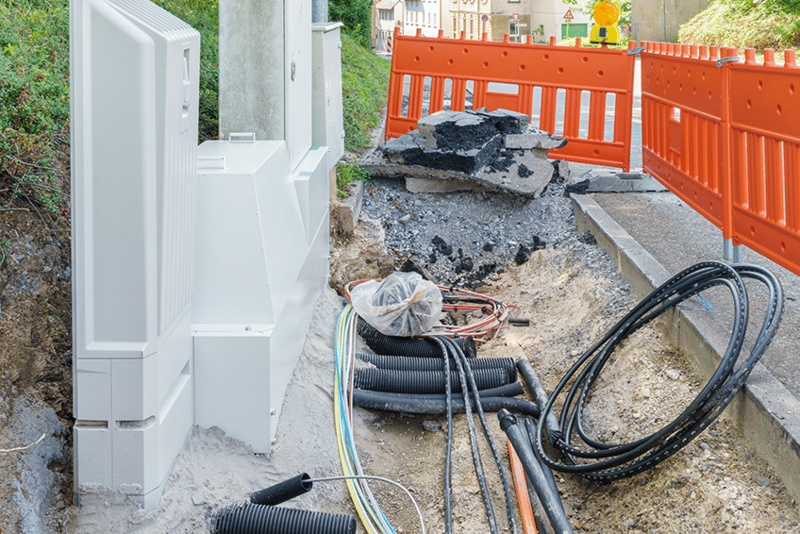 Wherever they are, citizens and businesses need connections which provide cycle rates of 50 Mbit/s and above. But broadband availability in this country is not what it should be. This is highlighted by the latest activity report published by the Federal Network Agency. According to the report, only 36 per cent of households in rural regions have access to 50 Mbit/s. In contrast, the figure for cities is 90 per cent. In Germany, a total of 77 per cent of households have an internet connection with 50 Mbit/s. According to government targets, this should be 100 per cent by the end of 2018. Whether they will succeed is highly questionable. A special report by the European Court of Auditors also takes a dim view. The authorities predict that the EU-wide aim of enabling speeds of up to 1 Gbit/s in all regions by 2025 is „probably not realisable“ in Germany with the currently-used technology. Heavy stuff. The EU auditors also give a specific reason for this malaise: vectoring technology. Vectoring is also the reason why, in this country, around three quarters of internet connections rely on copper-based DSL or VDSL(2). VDSL2 vectoring doubles the bandwidth by compensating electromagnetic interference (crosstalk) between the cables. This enables data rates of between 50 and 100 Mbit/s, even with copper cables. Some background: in crosstalk, VDSL2 signals couple in neighbouring cables, causing interference. This leads to a high degree of fluctuation or a general degradation of the transmission rate. It is the local loops to the end customer which are affected: these are buried unshielded in the earth in bundles, with up to 200 subscribers. Thanks to vectoring, network operators can compensate the crosstalk to a great extent and improve the bandwidth of VDSL2 connections. In vectoring, multiple VDSL2 lines are combined in a logical group – the „vectored group“. The interference patterns occurring for all the lines and frequencies involved are analysed and remedied. With vectoring, because the existing infrastructure is „pimped“, broadband rollout is significantly cheaper than for newly-laid fibre optics (which would require excavation work). However, vectoring to the main distributors can essentially only be carried out by a single provider: usually Deutsche Telekom. Other operators lose out. Furthermore, vectoring is not very future proof, since the achievable data rates of up to 100 Mbit/s will soon no longer be sufficient. In principle, clinging on to the copper cables leads to a broadband cul-de-sac, delaying the rollout of fibre optic technology which is more viable for the long term future. Fibre optic is the premium broadband technology. Fibre optic is characterised by low losses (enabling greater distances) and relatively good resistance to passive and active attacks. This includes, in particular, resistance to electromagnetic interference (interference due to machines, switches, lightning, transmitters, etc.) and light. The actual performance of a fibre optic connection depends upon how far the fibre optic cable is from the end customer. Variants are Fibre To The Curb (FTTC), Fibre To The Building (FTTB) or Fibre To The Home (FTTH). The closer the fibre optic cable is to your home, the higher the data rate. Generally, bandwidths between 50 MBit/s and 300 MBit/s are achieved. Of course, the best transmission is when the fibre-optic cable runs all the way into your home (FTTH). Green IT Solution GmbH is an expert partner for planning and implementing a FTTH project. We will handle the project management and the consulting work, delivering intelligent and cost-efficient hardware solutions. And you can rely on strong partners from our FTTH network. Fibre optic connections have a lot of catching up to do. According to the Federal Network Agency’s activity report quoted above, at the end of 2017 only around 675,000 households in Germany were actually using the technology (368,000 connections to the building (FTTB); 307,000 connections to the home (FTTH)). This means, in terms of modern infrastructure, Germany is still ranked as one of the worst in Europe. It’s time to take action!